Sunway International Hotels & Resorts, a company under Sunway Group, has signed a management agreement to operate the three-star Allson Capital Hotel Medan Tuanku in Kuala Lumpur in 2011. 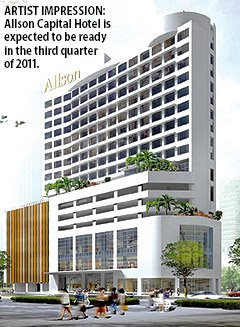 The 198-room hotel, to be built at an estimated cost of RM82 million by Capital Properties Sdn Bhd, will be ready in the third quarter of 2011. Sunway International's chief executive officer Hanley Chew said the hotel expects to achieve a 60 per cent occupancy and a RM175 average room rate (ARR) in the first year of operations. The bulk of its guests is expected to be the business crowd. Apart from the domestic market, the hotel is also targeting travellers from the Asean region, Hong Kong, India, Middle East, Australia and Europe. "Allson Capital Hotel Medan Tuanku will be fitted with business-class facilities, and will be designed to serve travellers who seek dependable, consistent and practical accommodation options. The hotel will offer 'selected services' accommodation for today's travellers without compromising comfort and design," Hanley said. The hotel is expected to offer room rates below the traditional full-service hotel, despite its location in the heart of the city. Some 55 per cent of its business crowd is expected to be corporate, contributed by multinational companies and the commercial sector from the Kuala Lumpur/Klang Valley areas. Another 15 per cent is expected to come from meeting and conference groups, both foreign and local. The developer of the hotel, Capital Properties Bhd, was formed in the 1960s to engage in the development of the Medan Tuanku area of Kuala Lumpur. A subsidiary of Glenmarie Estates Sdn Bhd, this is Capital Properties' first hotel project. Sunway International, meanwhile, manages and franchises hotels under the Sunway Hotels & Resorts and Allson Hotels & Resorts brand names. PETALING JAYA: Malaysia should promote “property” tourism to bring in foreign direct investment that would benefit not only the economy but also the retail industry. Prime properties like this one in Setia Eco Park might be attractive to foreign investors. 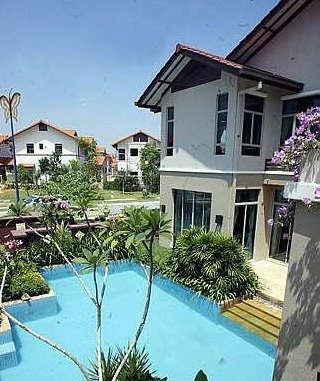 International Real Estate Federation (FIABCI) Malaysia president Datuk Richard Fong said some real estate agencies in Penang had started to bring in groups of foreign tourists under a “property” tourism package that included visits to property launches and show houses. The idea, he said, was to encourage these tourists to buy local property. As these visitors also shopped and stayed at hotels, their visits had benefited the hotel and retail industry, he added. Fong, who is Glomac Bhd executive vice chairman, said the newly set up Malaysian Investment Inc by FIABCI Malaysia and the Economic Planning Unit, would strive to promote Malaysian properties abroad. “With 1,000 foreigners each buying RM1mil worth of property in Malaysia, that will amount to RM1bil,” he said during a panel discussion on the “Synergies of shopping on tourism” at the Council of Asian Shopping Centres Conference 2008 on Wednesday. He said it had been found that each foreign expatriate who bought a home in Malaysia spent an average of RM10,000 a month. This would amount to RM10mil a month for 1,000 expatriates. “They will also bring their friends to visit Malaysia. This is good not only for local properties but also for all of you (shopping centres),” he said, adding that the Malaysia My Second Home (MM2H) had been “under-played”. Malaysian Association for Shopping and Highrise Complex Management advisor Datuk Eddy Chen, while advocating wholesome “family” tourism, also noted that “sin” tourism like casinos and karaoke lounges had brought in the big spenders for certain countries. While it was a good to promote Malaysia as a tourism hub, Chen said it was also important to look into offering more quality products and services and increase Internet marketing. “We’re neither here nor there whereas Singapore offers a cocktail of incentives,” said the Metro Kajang Group managing director. Tune Hotels Sdn Bhd chief executive officer Mark Lankester in calling for a revival of “sports” tourism said Tune Hotels and its sister company AirAsia Bhd, were making it affordable for tourists to travel and stay in Malaysia. By paying less on air travel and accommodation, tourists could spend more on shopping, he said, adding that it was part of Tune Hotels’ strategy to set up hotels near shopping areas and at shopping centres. Malaysia Association of Convention and Exhibition Organisers and Suppliers president Jonathan Kan called for more “cross border” selling to promote travel among Asean nations and bring in more international conferences to Malaysia. IVORY Properties Group is looking for an investor for the 450-room five-star hotel planned at its Penang Times Square development in Penang. Ivory Properties Sdn Bhd executive director Datuk Seri Nazir Ariff Mushir Ariff said the proposed hotel and podium block carry an estimated gross development value of RM250 million. "The 10-storey podium block will comprise six floors of retail outlets and six parking levels," he told Business Times in an interview. Nazir said the hotel will form the fourth phase of development for the RM400 million Penang Times Square project on the fringe of George Town's heritage enclave, which has been included in Unesco's World Heritage List. "We are seeking an investor who is also keen to operate the hotel whose rooms are expected to take up 200,000 sq ft over 20 floors. "Alternatively, we are willing to build the hotel if a renowned hotel chain is keen to operate it on a long-term basis," he said, adding that the proposed hotel is expected to break ground in 2010 and be completed by 2013. Ivory Properties managing director Datuk Low Eng Hock said the company has held initial talks with potential investors from the Middle East, but nothing has materialised as yet. According to Nazir, the first two phases of Penang Times Square, which include residential and commercial units, are scheduled to be completed early next year. "The third phase, which will include a convention and exhibition centre and a cineplex, is expected to break ground by the end of 2009," he said. The value of the residential units has already appreciated by 30 per cent, while that of neighbouring properties in the Datuk Keramat area has doubled. Penang Times Square sits on 5.2ha where one of the country's oldest tin smelting operations, Escoy Smelting Sdn Bhd, once stood. About 0.8ha has been earmarked by Ivory Properties for an urban open space and a heritage museum. Ivory Properties' other projects include the luxurious hilltop villas at its "Moonlight Bay" development along the Batu Ferringi tourism belt and "The View Twin Towers" which overlook the Penang Bridge. SINGAPORE: Las Vegas Sands plans to open its Singapore casino by end-2009 as scheduled despite a report that the project will be delayed, a Singapore-based company executive said yesterday. "We continue to target the end of 2009 for the opening of Marina Bay Sands," George Tanasijevich, general manager of Marina Bay Sands, said in a statement. His comments follow a report in the Straits Times newspaper yesterday, which said the casino project was several months behind schedule due to construction issues and a shortage of labour. An old sea wall built by British colonial rulers set back the laying down of foundation works on the construction site which sits on reclaimed land, the report said. According to the paper, event organisers said the casino had indicated that it would only accept bookings from April 2010. The Marina Bay Sands is being built on reclaimed land near Singapore's central business district and is scheduled to open in late 2009. The second, Genting International's Resorts World at Sentosa, is slated for completion in 2010. Resorts World may also see a delay in the opening of some of its facilities although a casino spokeswoman said it was "on track" for a "soft opening" in 2010, the paper said. The Straits Times said Resorts World at Sentosa was in talks with the government to defer the opening of some facilities in the US$4.1 billion (US$1 = RM3.55) project. However, four hotels, the Universal Studios theme park and the casino would open as scheduled in the first quarter of 2010, the paper added. The delay in the opening of some of the facilities is due to the need to find storage space for the equipment for the attractions in the Universal Studios theme park, it said. Resorts World at Sentosa spokeswoman Krist Boo denied there were any delays. "The development is progressing well and on schedule," she said in a statement. The plan all along was for a "soft launch" in the first quarter of 2010 with Universal Studios, Festive Walk, the casino and most of the hotels, she said. The other attractions, including the marine life park, a spa and two hotels were scheduled to open in subsequent quarters, she added.